These cool knives will make you think twice about what you think a “knife” is. Made for very special purposes, these knives are nothing like any normal knife you’ve seen. Key knives are legal in almost all states and can be purchased online. One of the things that are unique to knives is that they can be hidden in ordinary items. You can get a knife that is hidden in a key to place on your keychain for protection. This is a very effective way to protect yourself in the event of an emergency. (Read about the top 3 machetes that can save your life). This served as the idea for Gun Blades in Final-Fantasy XIII. There are knives that double as a gun. This is so that if your pistol does not do the job, the knife can complete it. This is a very specialized gun and provides protection from two angles. 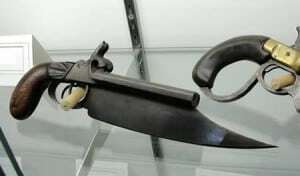 The pistol knife comes from the Renaissance period. These types of pistol knives are mostly used for decorative pieces now. 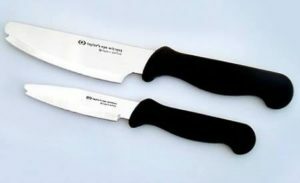 (Top rated dive knives). The pointless knife is a kitchen knife that cannot be used as a weapon. The reason is the blunt end of the blade. The knife has a rounded edge above the sharp point. This means it can only be used for cooking purposes. Disguised knives are legal in most states. 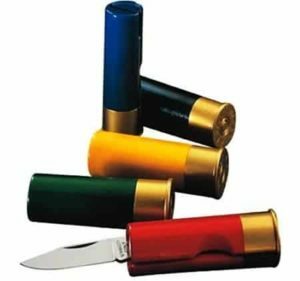 The shotgun knife is hidden in a shotgun shell. It is mostly a novelty piece. It makes a great outdoor sportsman’s knife. It is a simple design that will fool even the keenest of sportsmen. It has a 1 – 1/2” blade and can be hidden from sight until it is needed. (How to choose a balisong knife that is legal). (Learn about balisong trainers). The kill bill knife is an ornamental piece of work. It is a very fancy knife and noted to be one of the most expensive knives in the world. It is made out of the best steel in the world. It is noted to be the “Gem of the Orient”. This knife is a piece of art. The knife is inlaid with precious stones. 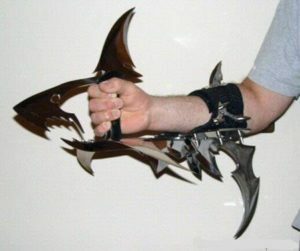 The shark knife is highly dangerous to use. It was inspired to look like a shark and be deadly. It is the most dangerous looking weapon that will help you have the advantage in any hand to hand battle. For the most part it should be used as a decorative piece because it is so dangerous. (Best throwing knives for beginners). Good for defense against aliens. 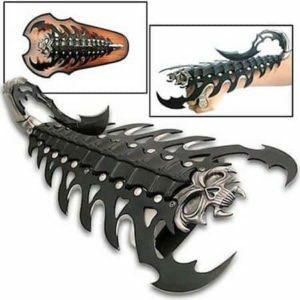 The scorpion knife is scarier than most knives. It can be worn as a wrist knife, like a bracelet. 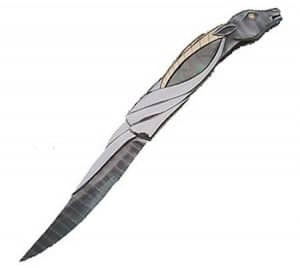 If you come across a person wearing this type of knife it is best to head the other way. This knife can be very dangerous. This knife is huge but not as huge as this knife. 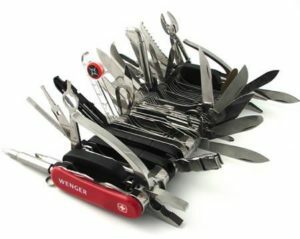 The Swiss army knife has just about anything that you want in a knife. It will operate in most functions that you will need. It is very practical. This can mean that you can get a multitude of functions done with this knife. 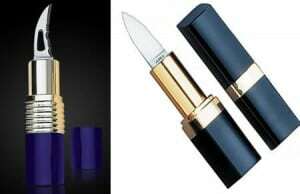 The lipstick knife is hidden in a lipstick case and can be a woman’s best friend in the event of an attack. It is compact and elegant. It features a 1 1/4” blade. It has a glossy deep blue finish on the casing. It is discrete and practical. As seen on Sci-Fi flicks. 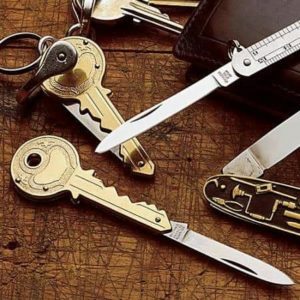 The Impala knife is an art deco liner lock folding knife. It features a ladder pattern with an Impala head. It sports 14 karat gold horns in the handle that introduces the rear of the handle. It is a very graceful and flowing knife. Custom knives can come in many forms. They can be disguised in any form. These are just a few of the unusual knives that can be found on the open market. Custom made knives can be a weapon that could save your life if you are in danger.